This week’s project spotlight is on one of our own creations. Since we love books and design so much, we can’t let authors have all the fun. 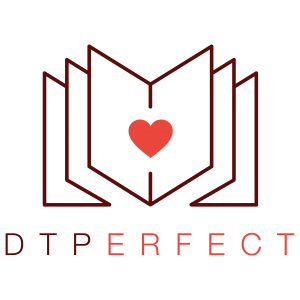 So, we at DTPerfect sometimes publish things too. This planner was created primarily because I (Elena) love to plan, love colors, and love inspirational quotes. Based on the idea of positive affirmations, the planner has spots for writing affirmations to repeat throughout the week and month. The idea is that the more we repeat positive affirmations, the more we begin to believe them, and the closer they become to our reality. Even if you don’t believe that, the planner is at least eye candy for your desk. The first few pages in the planner include a “How to Use This Planner” and “How to Create Positive Affirmations” so that you are set up and ready to go. The rest is up to you and your imagination. The planner is currently available on Amazon. Inspiration for your desk. Plenty of space to write, as the planner measures 8 x 10.88 inches. Why print-on-demand? While this does make the the production cost-per-book higher, it means that I did not need to invest into printing 1000+ copies. While I wouldn’t mind selling thousands of copies of the planner, that was not my priority. The priority was to create it, no matter the sales volume. Printing on demand gives me the flexibility of selling a high quality item without storing any inventory (or shipping, for that matter). Another note: the planner uses IngramSpark’s standard color printing on 50# paper. Though this is usually advertised as their lower quality printing, I was pleasantly surprised by the quality. The color printing is not coffee table quality, but it’s very nice for a planner! The paper is on the thinner side, but that also works quite well for this purpose, as the thinner paper makes the planner lighter and easier to carry (as compared to using the 70# paper). At 246 pages, the planner is already quite large, so keeping the spine thickness down was a big consideration. Overall, I was quite happy with the production quality and color printing (even on 50# paper). If you’re considering a print-on-demand production through IngramSpark, we’re happy to answer questions about the process. Contact us to learn about various consulting options. Below are some images of the planner. Each day gets a half vertical page (so 2 spreads per week). There’s plenty of space to write, plan, and reflect on your day. For more images, visit our Portfolio page.